The Indie Design GAL is now at the end of it's second week, and the Ravelry group is getting busy! There are still lots of ways to join in; if you'd like to, head over to the Ravelry group. * Here's the fourth of my series of interviews with GAL designers. 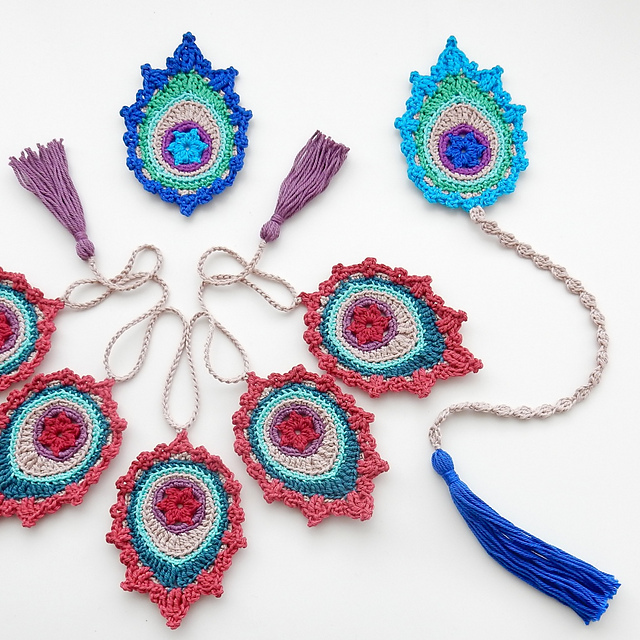 Christa Veenstra is a crochet designer based in the Netherlands. Her designs are inspired by 1920s Art Deco, and feature striking motifs worked in bold colours. Her designs are beautiful, and can be used as bunting, interior design details or on clothing. Thank you so much Vikki for having asked me to be part of your interview series. Let me start by introducing myself briefly. My name is Christa and I live in the northern part of The Netherlands. I studied English Language and Literature and I used to be a University teacher specialising in academic writing and presentation skills. I’m still using and working with the English language every day though. I translate and edit crochet patterns for publishers and of course I’m part of a wonderful international crochet community. Just over two years ago, I started designing and pattern writing, which very quickly led to my own crochet business TheCurioCraftsRoom. I love having my own business and I’ve met some wonderful, like-minded and generous people through it. It’s such an amazing community. When did you learn to crochet? I can’t remember not being able to crochet. I learnt it at a very young age from both my mother and grandmother. My grandmother especially was always crocheting, knitting or sewing. Just always making things and I can remember being spellbound by how quickly she could make a set of new clothes for my favourite doll. So naturally, I wanted to be able to do all that too. I can sew and knit but crochet is the craft I love most of all. How did you get into designing and pattern writing? A few years ago I had a burnout (or rather, to speak with Brené Brown, I unravelled to be able to have a spiritual awakening) then I lost my job and took all of that as a sign that I needed to change direction. So after a lifetime in academia, I switched to something unknown and uncertain. First I trained people who were overstressed and highly sensitive to become more mindful but then I felt it was important for me to make things with my hands. I picked up a crochet hook (again) and just thought let’s try and make a peacock feather. I’ve always liked the shape and colours and I have a bunch of them in my living room so I just designed one or two motifs. I listed the finished items in an Etsy shop and received many requests for the patterns so I started making those. And then I couldn’t stop designing peacock-inspired items. I guess I’m the peacock lady now here on Ravelry and on Etsy. I’m so grateful for all the lovely feedback I get on my work and for having been able to set up my own design business. What designs do you have in the pipeline? At the moment I’m looking into designing larger items like shawls or throws. I’d love to expand the range of patterns I sell and not all of them need to be peacock-inspired. I’ve almost finished a pattern for a scarf with join as you go motifs and I’m working on a commission, which I can’t tell you about yet because it’ll be published in the spring. I can tell you it’s something completely different and out of my comfort zone because it has a zillion non-peacock colours in it. 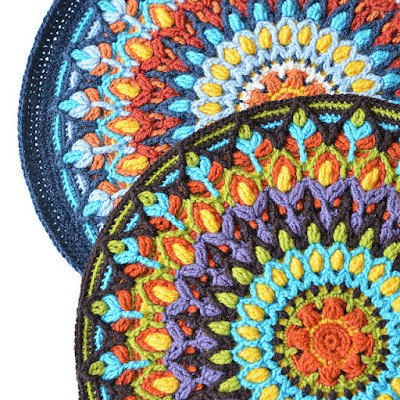 Of course there will be new small peacock items too, like a pincushion and another large single feather motif. What crochet techniques would you like to try in 2017? I’d like to become more experienced in overlay crochet. I find that my long front post stitches could be a lot neater so I have to practise making those. 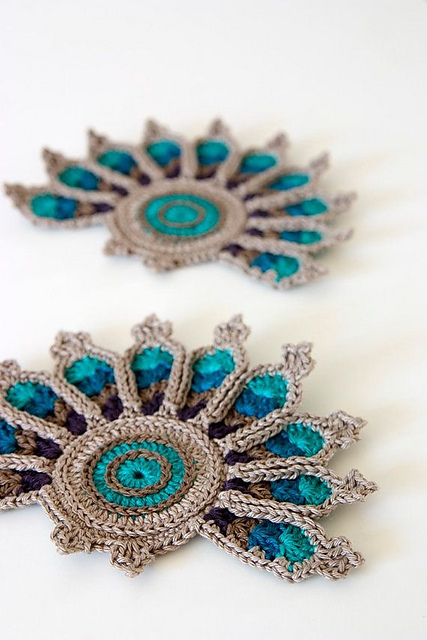 And it would also be great if I could design some overlay crochet myself. Learning tapestry crochet is also on my list. I haven’t tried it yet but I’d love to learn how to make beautiful “drawings” with it. Which other GAL designers have caught your eye? You just have to have a look at the work of Tatsiana Kupryianchyk, the wonderful overlay crochet queen behind lillabjorncrochet. I know her personally and she is such a sweet and talented lady who always amazes me by the rate at which she published new designs. They’re always so beautifully executed and original. Christa can be found on Ravelry as ChristaVeenstra. Christa blogs at thecuriocraftsroom.blogspot.com and can also be found on Facebook (facebook.com/thecuriocraftsroom) and Instagram (@thecuriocraftsroom). *Note that you will have to signed in to Ravelry for this link to work. Joining Ravelry is free and Ravelry is an excellent resource for knitters and crocheters. Yarn review: DMC Top This!